Our starting point was the region Scooter on jokaydiaGRID, and our final destination was the region Lani on OSGrid. A total of 19 avatars made the journey together. Since the region Scooter on jokaydiaGrid and the region Lani on OSGrid are very far away from each other on the Hypergrid (about 8,000 regions apart), we had to make 2 hypergrid jumps and visit 1 intermediate grid during our journey. Getting ready on the region "Scooter" on jokaydiaGRID. From there, we all jumped to the region Gateway1 on Sanctuary grid. 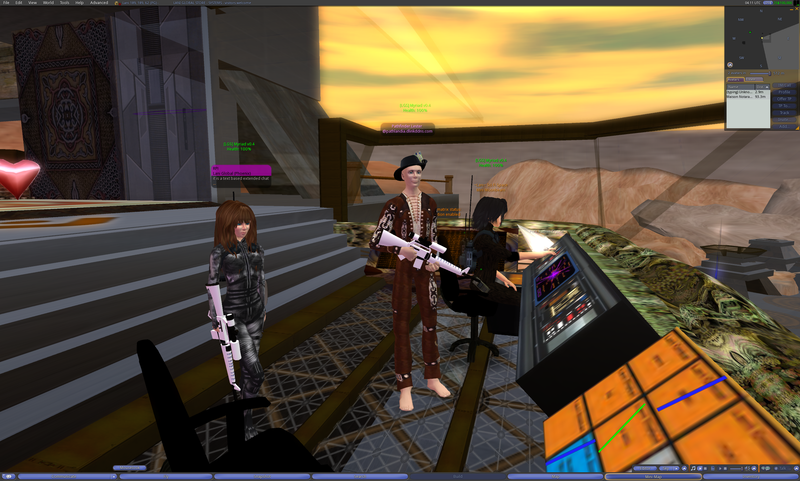 Meeting on the region "Gateway1" on Sanctuary grid. 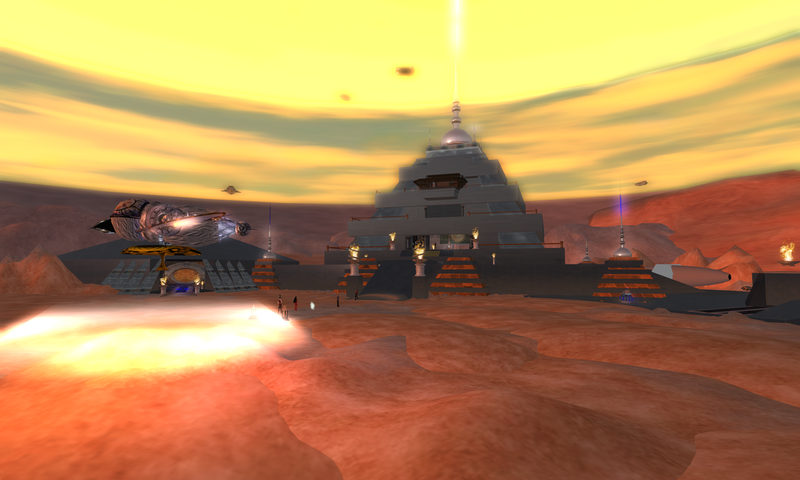 For our final jump, we jumped the region Lani on OSGrid. We arrive at our final destination, the desert planet of Dune. You can get this free ornithoper vehicle to fly around. Great fun! There's also a free personal hovercraft available. 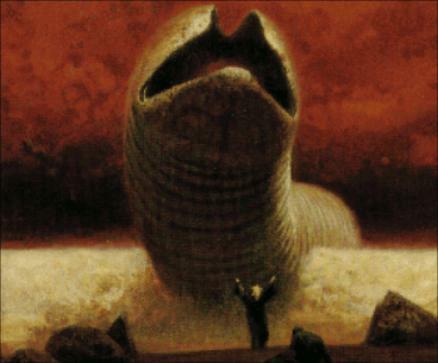 I told you WATCH OUT FOR SANDWORMS ARRRRGH! The whole area is stunning. Must-see’s include the sci-fi themed store (lots of freebies), a hidden underground aquifier, and a giant space station far above the planet. Just walk in the main pyramid and you can find teleports to all these different places. Be sure to try some of the quests, too. Lani Global gave me a tour of mission control. And a cool gun. If you complete the Rare Radion Crystal quest in the Aquifier Caves, you get this award! 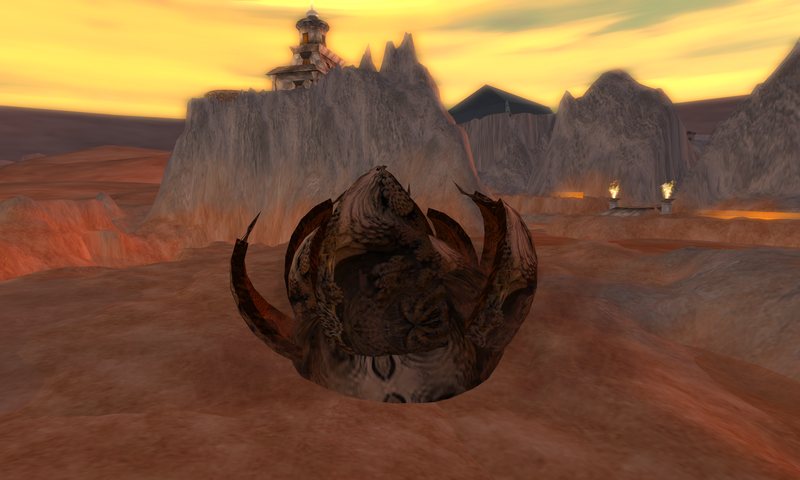 This entry was posted in Announcements, Education, Hypergrid Adventurers Club, Virtual Worlds and tagged avatars, Dune, education, HyperGate, HyperGrid, Hypergrid Adventurers Club, Jibe, jokaydiagrid, metaverse, online communities, OpenSim, opensimulator, ReactionGrid, virtual worlds by John "Pathfinder" Lester. Bookmark the permalink.